Cat Chat With Caren And Cody: Happy Birthday Dakota!! to wish him a HAPPY BIRTHDAY! Awww lovely Cody!! You look ready for sweet Dakota's Pawty!! Yay!!! You did a great job Cody. We will stop by to see Dakota too. Hope you get your cake soon. Happy birthday to Dakota! We'll mosey on over to his own blog! Hope you've lots of treats too, Cody! Birthdays and Gotcha Days are lovely! We just know Dakota is gonna get spoiled rotten today! 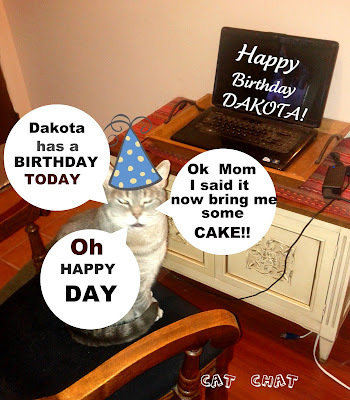 This picture is awesome, happy happy Birthday sweet Dakota, all love and purrs to you! Very nice of you Cody to acknowledge your brothers birthday! HAPPY BIRTHDAY! May your day be filled with hugs & purrs, love & cuddles and lots and LOTS of nip. Oh, and cake too. Must have cake on a birthday. I think it's a law or something. Thanks Cody, we will head that way! Happy Birthday to your Dakota! You sure are decked out for a party. Happy Birthday, Dakota! You're lucky that you have such a special mom and brother! Your a great brother and I love it..oh happy day...you crack me up Cody!! Enjoy the cake!! Happy Birthday Dakota, we hope you have a great day!!! Cody, you look so thrilled! BOL! What a bash you are throwing for Dakota. I'll go over right now. Thanks for alerting us to Dakota's big day-we'll head over there now! We went over and wished Dakota a Happy Birthday. We hope you got your cake Cody. So sweet of you to give Dakota some blog moments, Cody. Happy Birthday Dakota.....may you'll be loved by Cody forever and ever. purrr.....meow! THANK YOU to everyone who wished Dakota a happy birthday both here and on his blog! You made him such a HAPPY DOGGY today!!! Aww, I'z jus now seein dis, Cody... so I'z wishin Dakota sum Happy Tail-End (teehee!) uv da Birfday joy! (By da way, good job on da sincerity fhing in da pikshur... molmol!) Bonks 'n kitteh kissez to awl uv u! Wes stopped by and wished Dakota a Happy Birthday and me and Kozmo and the Hairy Slobbery Sisters Bob and Cinnamon singed him Happy Birthday! Oh my goodness, I took a day off and missed Dakota's birthday! Happy Belated Birthday Dakota. Hope you had fun.